“You bargaining with us? 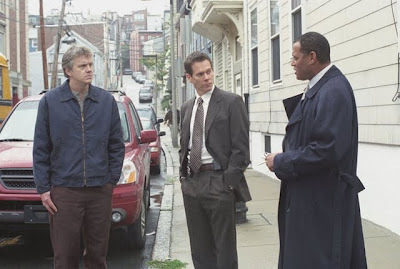 Giving us a deadline...” Laurence Fishburne's police officer inquires Sean Penn's grieving Jimmy Markum after Markum asks how long it will be before the man who killed his beloved nineteen-year-old daughter Katie is brought to justice. And considering the fact that Fishburne's partner Kevin Bacon was childhood friends with Jimmy in their Boston working-class community, it's fairly understandable that it's Fishburne's job to play “bad cop” even though Bacon's “good cop” says he'll have no problem hauling away anyone from the old neighborhood, whether it's Jimmy Markum or their third troubled amigo, Dave (Tim Robbins). Yet, while to the cops, Jimmy's coolly enraged demeanor may only indicate the macho posturing of a man who's done a stretch in the pen, the audience already realizes from the first moment we see Jimmy Markum that he will be the one to exact not just justice but brutal revenge. 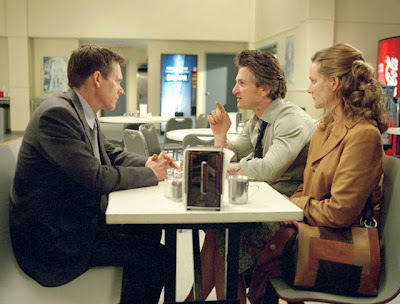 Penn gives one of his finest along with what appears to be the most physically and emotionally traumatic performances of his career in Clint Eastwood's masterful adaptation of Dennis Lehane's novel transferred to the demands of the movies by screenwriter Brian Helgeland. Shot in under forty days-- Penn puts himself through such a harrowing portrayal that after he breaks down while screaming his lungs out and being physically held back from the discovery of the murdered body of his daughter (Emmy Rossum), Penn reportedly requested that an oxygen tank would be on standby. And given the steely determination in his equally lifeless eyes, we know he will do just that... even if it means not only running his own investigation with his old crew The Savage Brothers but also going after anyone else that may have played a part in Katie's death whether it's himself or someone he's known his whole life, which brings us to Robbins' Oscar winning portrayal of Dave. As the movie begins, it presents one of the worst urban nightmares known to children and parents everywhere as the three kids-- now a cop (Bacon), a criminal (Penn) and a low-key father (Robbins)-- play in the street drawing their names in wet cement. In a brilliant display of metaphor and overlap, which is used throughout the allegorical, ambiguous masterpiece by Eastwood, Dave is only able to spell the first two letters of his name before two men impersonating plain clothes police officers fast-talk him into the car. Kidnapped for days, Dave was finally able to become “the boy who escaped from the wolves” as he relays in the form of fairy tale bedtime stories to his son in present day. And although he did indeed return, the Dave that everyone knew and loved-- the Dave who smiled, laughed, and was innocent-- never did return, having vanished during a critical time in his development as a pubescent boy and then coming back as a shell of a man who feels half-alive like those two letters in his unfinished name staring back up at him in cement. 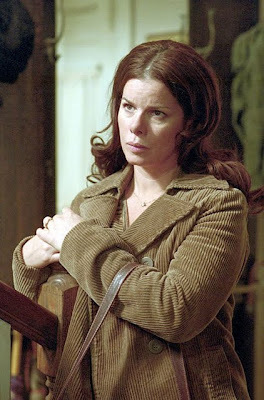 When Dave startles wife Marcia Gay Harden by returning home from the bar in the wee small hours of the morning drenched in blood and with a hacked up hand, his wife backs up his mugging story that keeps changing from person to person. Yet because Katie's death happens to coincide with the very same time and date of Dave's bloody encounter and he was the last person to see her alive aside from the killer, all fingers point towards Dave in wonderment if he's now become the wolf instead of the victimized child. While to be sure Mystic River is an emotional drainer as tears and blood will flow from your eyes and through your veins, it's a curious and remarkable achievement for Eastwood because it defies the strict paradigm of a revenge genre drama. 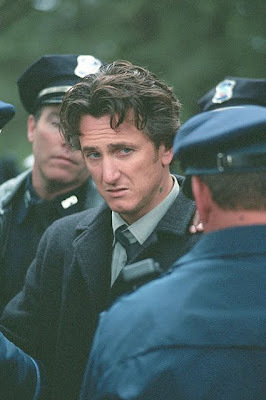 Yes, we have a character who is hell-bent on revenge and another character who merely escaped and never got his revenge but the brilliance of Mystic River is in the way that that evil car rolled down the street changed everyone's life. What happened to Dave was one excruciating thing but what happened to everyone else was different as well as none of them were the same, making it no wonder that Dave's friends went to extremes in their actions to pursuing justice or taking what they wanted in life as a cop and a crook respectively. Having read the book, I remember being slightly dismayed by how much plot and back-story was dropped, especially with regard to Kevin Bacon's woefully underwritten character. Yet amazingly, when seeing the work on Warner Brothers Blu-ray seven years after I first read it and caught it on Halloween night in 2003, I was surprised to realize just how much plot and gritty imagery I recalled as it filled my mind as well as the screen at the same time. 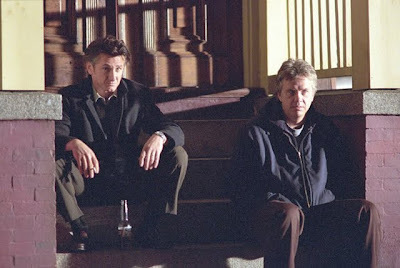 Despite being taken by it back when it was released, having screened it again recently, I now realize why Mystic River was the most requested film for my film discussion series back when I hosted public showings and lectures. Unfortunately, however, time ran out before we ventured into the Mystic but nonetheless I couldn't help noticing that-- much like films we did view such as Road to Perdition and 3:10 to Yuma-- just how much Eastwood's opus demands multiple viewings. Obviously, it will test your nerves to sit through it again as it's tough going in its themes and unrelenting darkness. However, you can't help but admit how brilliant it is in its execution as far as mirror images, dual roles, character and plot echoes are concerned. 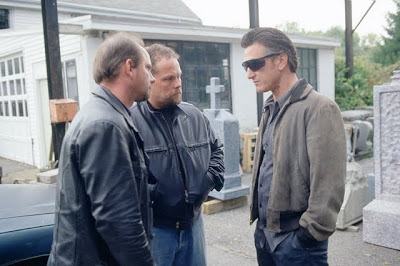 Heavily allegorical considering the way events line-up both audibly and visually to unique precision,a second viewing of Mystic River begs the question of whether or not Eastwood and cinematographer Tom Stern story-boarded every single frame or they just knew how to double back on previous actions from memory in the breakneck shoot. 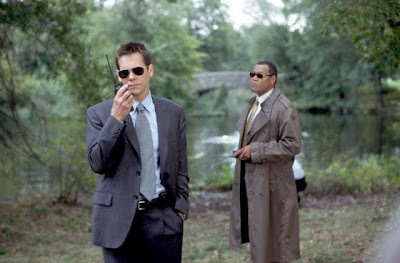 With first rate performances by a stellar cast that also includes Laura Linney who commands a speech near the end of the film in a way that tricks you into believing Mystic River is Boston Shakespeare, the Blu-ray--boasting commentary by Kevin Bacon and Tim Robbins-- also discusses their take on the ambiguous ending, and includes interviews with cast mates aside from Penn, who was probably on an IV drip after shooting to restore his energy. Perfectly fitting in with Warner's release of Clint Eastwood: 35 Years, 35 Films and hot off the Oscar and Golden Globe nominees for his most recent work Invictus, this sharply defined Blu-ray has a nice crisp look to the work which is extremely important given the fact that from the costuming to the production design, the color spectrum mostly consists of colors you can wear to a funeral. A remarkable feat that ushered in another excellent decade of Eastwood's direction including his masterpiece, Million Dollar Baby, the River in Mystic may indeed threaten to drown you in devastation but if you stay by the shore, you're sure to stay afloat... riveted completely by the story of characters who bargain their way into good and evil.